One of our most recent projects required us to get a grip on the Magento e-commerce platform. The client was request a "How did you hear about us" feature on the Magento onepage checkout form. Rather than spend the time to learn exactly how Magento is setup and learn a new flavor of PHP, we figured a module would be best. Luckily, we found free module that did the trick! Inchoo is the company that created this module. 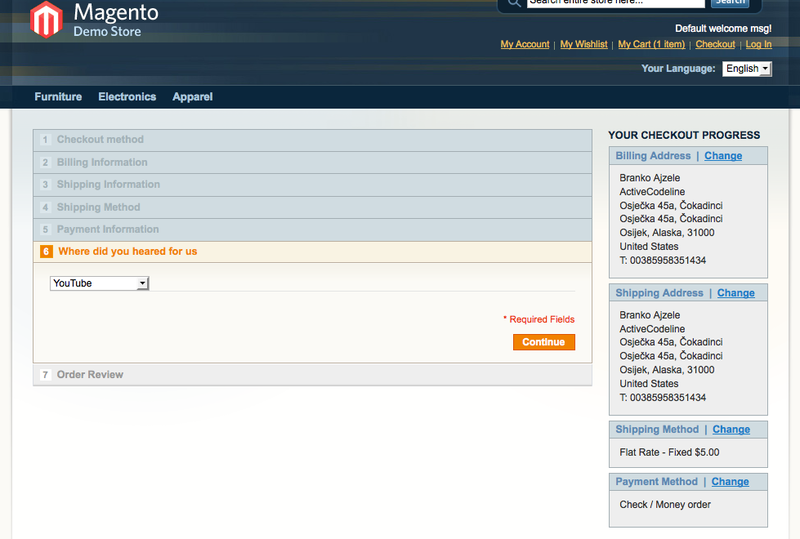 The module essentially places a drop down option by default under it's own tab in the Magento onepage checkout. In order to get this module to work properly in Magento 1.5, we need to edit some files. First, we need to download the extension and unzip the files. Open your favorite FTP client and drag and drop the files into the root directory of your Magento 1.5 installation. Once the extension is in place, log into the admin side of Magento and navigate to System > Configuration > Design > Admin Theme. We need to enter in custom into the admin theme field and save. Once that is done, we need to dig around in the files to make this extension compatible with our English-speaking users and allow the extension to actually work!. Open your favorite IDE or text-editing program (notpad or textedit) so we can edit this code. Note: if you don't have access to edit the files before you place them on the server then edit the files on your local system and then upload them to the server. Then we only need a few minor tweaks before we can achieve this feature! First, we need to comment out the array which contains our drop down menu options. Typically, it's good just to keep the variable set to an empty string, you never know if it is being used by something else and an error will occur. There are few things we must do in order to enable either of options or the user input value to show in the admin side. We must navigate to app/code/local/Inchoo/Heared4us/sql/mysql4-install-0.1.0.php and open the file with your favorite IDE of text editor. Next, we need to add a new field to a table so we need database access with a tool like phpMyAdmin. If you do not have database then contact your administrator and request the following change. Be sure you add semi-colons otherwise MySQL will complain. It is imperative you know your prefix as well. You can find this information in your local.xml file along with your database credentials. If you do have database access with phpMyAdmin, select your magento database and click on the SQL field. Copy and paste the SQL above and then press "Go". See the image for details. This entry was posted by Dennis Thompson on June 23, 2011 at 8:14 pm, and is filed under Magento, PHP. Follow any responses to this post through RSS 2.0.You can leave a response or trackback from your own site.